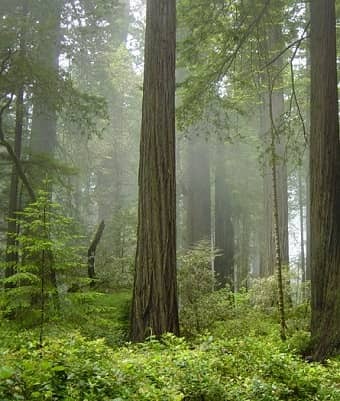 Temperate rainforest have mild (temperate) climates. These regions generally never have extremely hot or extremely cold weather. In the winter the temperature rarely dips below freezing which is 32 degrees Fahrenheit (0 degrees Celsius), and the summer months rarely see temperatures above 80 degrees Fahrenheit (26.67 degrees elsius). What makes these biomes so mild is there proximity to the ocean on one side and mountain ranges on the other side. The ocean water releases heat during winter making costal areas warmer and absorbs heat in the summer making costal areas cooler. The coastal mountain ranges trap the air rising from the ocean during the winter controlling the temperature and causing large amounts of rainfall. Temperate rain forests have two seasons; a long wet winter season and a short dry summer season. During the dry season dense fogs are common in these forests which help provide the moisture needed to sustain the plant life during times of less precipitation. This is especially crucial for regions where the dry season receives little rain relative to the wet season like the temperate rainforest along the west coast of the state of Washington in the United States. This region receives very little rainfall during the summer months (about 6-9 percent of its annual rainfall). Further up the coast in Alaska and Canada both seasons receive significant rainfall lessening the forests dependence on fog for moisture during the dry season. The gradual increase in the average atmospheric temperature of the earth which is called global warming has an effect all regions of the earth including the temperate rainforest. This gradual warming has been going on for many years and the exact causes are not known although many scientists believe it is due to the greenhouse effect. The greenhouse effect involves the trapping of solar radiation in the earths atmosphere by gases such as carbon dioxide. This warming is certainly changing growing conditions in temperate rainforests. Increased warmth does not negatively affect all plant species and many actually benefit from the higher temperatures. The deforestation of the temperate rain forests, which has been going on at an alarming rate for centuries, adds to the greenhouse effect. Trees are crucial for the removal of carbon dioxide (CO2) from the atmosphere, as the number of trees decrease more of these gases remain in the atmosphere. The true effects of this change may not be known for many years to come.